1 roll of Blue Tape, a DipWasher, 2 Decals, Mixing Sticks and Microfiber Towels. MATTE FINISH – Matte kit provides a matte finish. 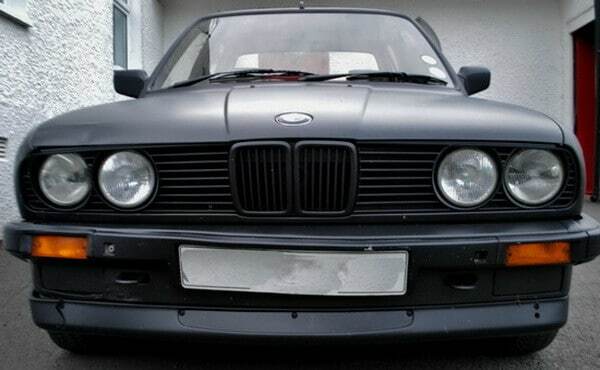 Here is the BMW we used for this Plasti-Dip Kit review test. There were multiple dents and scratches that we wanted to cover. This vehicle needed a new paint job so we thought covering the entire car with the kit would be a good solution. We first washed the vehicle thoroughly, let dry, then taped and covered everything we did not want covered. Make sure you have a very sharp razor blade to cut the tape so the ends are even and do not overlap anything. 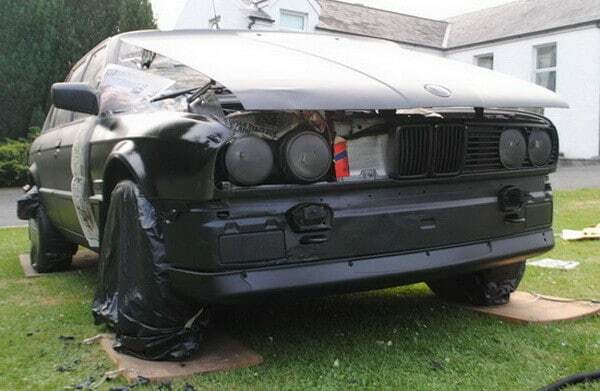 Everything needed to be covered including the BMW car emblem, windows, the tires, the lights and more. 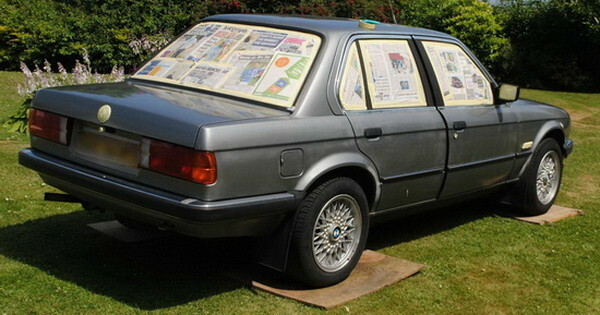 Make sure you tape off absolutely everything that you do not want covered from the paint kit. Preparation time will take you approximately 3 to 4 hours depending on vehicle type. 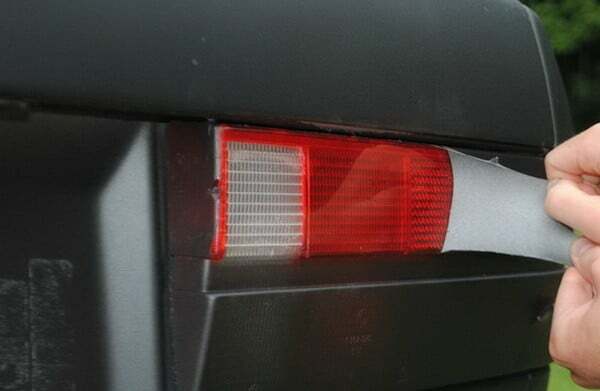 Note: The plasti-dip can be removed fairly easily but save yourself the trouble and tape things well! In this photo we are applying the first coat of our Plasti-Dip to our vehicle. It sprays on very easy and smooth with the sprayer that is provided in the kit. It took us about an hour to apply the first coat as we were being very careful not to make drips. After we gave the first coat about 30 minutes to dry, we applied the second coat. 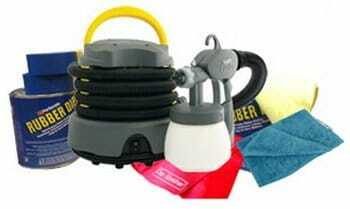 It is recommended to give your vehicle 3 to 5 coats to create a long lasting hard shell. We sprayed the front of our car also including the grill, front bumper and tow hooks. We did not cover the headlights but we recommend doing so as scraping it off took time. Here we are spraying a little extra on our front fender as we needed to cover up dents and scratches. 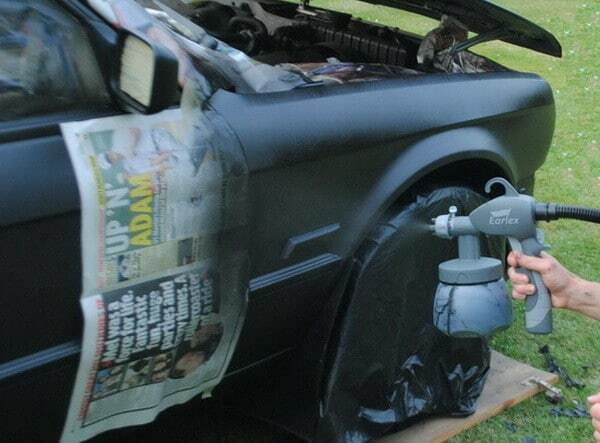 Using the Plasti-Dip kit is a truly great way to cover over minor cosmetic blemishes on your car. Here is our vehicle totally sprayed and drying. Total time so far is about 5 hours. A larger car might require a bigger spray kit and obviously more time involved. Once we let the dip kit completely dry, removing the tape was fairly easy and fast. you will need many more hours scraping off the material and touching up areas that did not get enough applied. Here is the front of the vehicle completely “dipped” and finished with tape removed. This type of application will last you from 1 to 3 years if your car is parked in a garage and not driven in heavy snow. You can apply Plasti-Dip to your rims or wheels if desired and the aerosol can spray is best for small applications. Here is a side view of our fresh plasti-dip application vehicle. It looks great and will last for years! 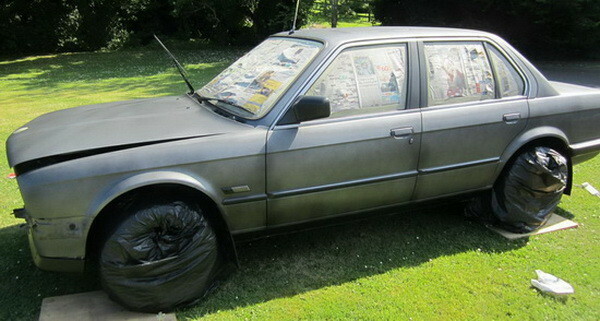 Overall we would recommend doing this to a vehicle that needs a new paint job or a used car with dents. If you are planning on “dipping” a brand new car, we would not recommend it as this can severely damage paint. Can this be applied to a boat, 17 ft fiber glass boat bull to be exact? These DIY kits are really helpful to use as they are easy to maintain and are now becoming more and more popular. 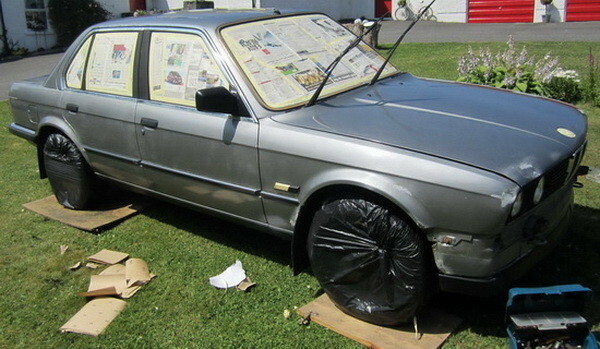 These kits are removing the need for a person to visit a paint shop to get their cars painted. People should consider these kits but they should know that the paint job that a certain professional will do, simply cannot be done by using these kits. Hello, I do auto body repair and paint for a living and have 30 years under my belt. Use some wax and grease remover on the car, you just spray it on and wipe it off until its dry. Just a thought I’d throw that in, it might save you from a redo on a spot or two and redoing redo’s is not fun. The car looks good and that is way cheaper than a paint job and about 1/4 of time. That’s a great idea! I’ll have to keep that in mind. Does it wash well? It takes much more care when washing. If you plasti-dip your car it is a good idea to never let any car wash company wash your vehicle. Wash it yourself with a regular hose and super soft brush. Otherwise the car wash “machine” can damage the finish.